Italy’s PM Enrico Letta has threaten to resign unless his cabinet gets clear backing in a parliamentary vote expected to be called next week. 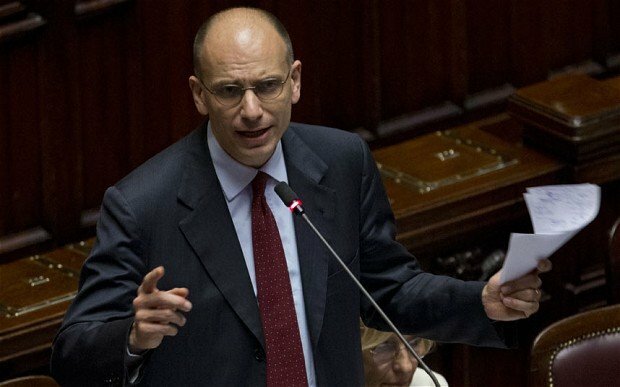 Enrico Letta’s warning came after the government failed to approve key budget measures. His government is an unstable coalition between his party and that of ex-PM Silvio Berlusconi. Silvio Berlusconi could lose his Senate seat after his fraud conviction. His backers say they would leave the cabinet in protest. “I have no intention of limping along or being the subject of continuous threats,” Enrico Letta said in a statement after the government meeting late on Friday. Two government ministers said that Enrico Letta was now planning to call a confidence vote in parliament next week. The cabinet is close to collapse just at a time when Italy desperately needs political stability if it is to begin to emerge from its long economic crisis. If Silvio Berlusconi’s PDL pulled out of the government, it would lead to snap elections. President Giorgio Napolitano and business leaders have warned against new polls while is still mired in recession, saying they could reignite fears about the country’s stability and financial position. According to a 2012 anti-corruption law, Silvio Berlusconi should be ejected from the upper house after the Supreme Court last month upheld his fraud conviction. After a party meeting on Wednesday, Silvio Berlusconi’s MPs threatened to resign en masse if the Senate votes next week o expel their mentor. The Italian news agency Ansa cited sources who said PDL members were already writing out their resignations and threatening to hand them in to the party whips. Silvio Berlusconi has been sentenced to a year in prison, but because of his age is expected to serve house arrest or community service. Last week Silvio Berlusconi vowed to stay in politics even if he lost his place in the Senate.